What are risk factors for an abscessed tooth? How do health care professionals diagnose an abscessed tooth? 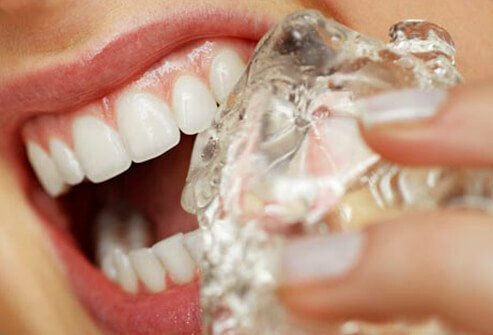 Are home remedies effective for an abscessed tooth? What specialists treat an abscessed tooth? What is the prognosis for an abscessed tooth? For the most part, poor oral hygiene and dental care increases the risk of infections for teeth. Grinding or clenching teeth (bruxism), high sugar diet, other tooth trauma, and even the presence of previous dental work can predispose an individual to tooth abscess. The initial symptoms begin with localized swelling and pain that gets progressively worse over a few days. A tender and sore mass (the abscess) may be felt with a finger and gingival bleeding may occur. Periapical abscesses may be very sensitive to cold and heat. There are many causes for a tooth abscess. A very common cause is when a dental cavity (decay) becomes so large and deep that it reaches the pulp chamber. An inflammatory process takes place within the tooth. Inflammation of the pulp (pulpitis) is usually what is felt as a toothache. Pulpitis is further characterized by tests done by a dentist as reversible or irreversible. Reversible pulpitis means that the pulp is irritated but has an opportunity to recover. Irreversible pulpitis means that it will not recover, and the pulp is dying. Once the pulp is dead (or "necrotic"), an abscess can form as the infection spreads from the tooth to the gum ligament and jawbone below. Often, a tooth that becomes necrotic can still be saved if steps are taken to resolve the infection at an early stage. 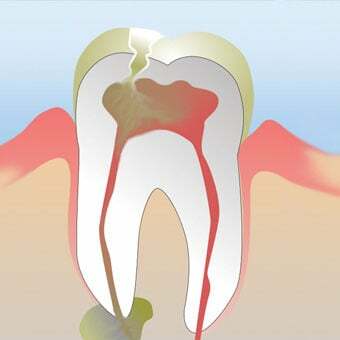 Other causes for a tooth to become necrotic and abscess are (1) a blow to a tooth, (2) dental treatment such as a crown or a filling that gets too close to the pulp chamber, or (3) trauma to a tooth from grinding or clenching. In every form of a tooth abscess, the pulp is adversely affected and is unable to recover from the insult or injury. A blow to the tooth can immediately sever the tooth's blood supply. When the blood supply is lost, the nutrient supply is also lost. As a result, the pulp quickly dies. Trauma from grinding or clenching (called "occlusal trauma") is a slower, progressive injury to a tooth. A tooth that has been previously treated with a root canal procedure can also develop an abscess. This is often due to the lack of adequate seal from bacteria within the tooth or even a fracture of the tooth roots. The tooth turns dark in color compared to surrounding teeth. The byproducts of the necrotic pulp that leach into the porous tooth layer cause this discoloration. In many cases, there may be no pain present. There is swelling on the gum that is filled with pus. The raised swelling looks like a pimple near the affected tooth. An open pimple is called a "draining fistula" and has ruptured to release pus. This is an obvious sign of infection. Other signs of a tooth abscess are a bad taste or bad odor in the mouth. Swelling of the face, jaw, or surrounding lymph nodes often signals a growing infection. Jaw pain from the swelling can be present, as well. A primary care provider or pediatrician can assess the signs and symptoms to determine if a dental abscess is present. They can then refer the patient to a dental provider for diagnosis and treatment. Diagnosis of a tooth abscess is collectively determined by (1) signs and symptoms reported by the patient, (2) exam and tests that are performed by the dentist, and (3) what is visualized with dental radiographs (X-rays). In adult teeth, the usual treatment for an abscessed tooth begins with properly clearing the infection. Treatment depends on how much the infection has spread. The course of action usually involves oral antibiotics such as penicillin. The tooth is opened to remove the infected contents within the pulp chamber. If needed, incision and drainage is performed on the soft tissue to provide further exit of pus and pressure of a growing infection. In some situations, the infection can spread quickly and require immediate attention. If a dentist is unavailable and there is a fever, swelling in the face, or swelling in the jaw, a visit to the emergency room is recommended. An emergency room visit is imperative if there is difficulty with breathing or swallowing. Once the infection is cleared and the tooth can be restored, a root canal procedure is performed. The "root canal treatment" cleans out the entire inner space of the tooth (pulp chamber and the associated canals) and seals the space with an inert rubber material called gutta percha. Cleaning and sealing the inner space protects the tooth from further invasive infections. The tooth may need to be extracted if too much tooth structure or bone that surrounds the tooth is lost from tooth decay and infection. For children's primary teeth (baby teeth), if a tooth has abscessed, there is very little that can be done to save the tooth. The infection has advanced and there is no way to completely remove all of the infection. The appropriate treatment to eliminate the infection would be extraction of the abscessed tooth. Complete removal of the abscessed tooth is also important in avoiding a persistent infection that could risk harming the adult tooth that is developing underneath. Oral antibiotics may or may not be needed depending on the extent of the infection. During pregnancy, a dental abscess requires immediate attention in order to minimize further spread of the infection. Any risk of infection while pregnant is a concern as the infection can be more severe in pregnant women or could harm the fetus. Generally, home remedies are not advised for an abscessed tooth. Home remedies can be used to temporarily alleviate symptoms such as warm saltwater or baking soda rinses, a warm moistened teabag compress over the area and taking over-the-counter analgesic medications such as nonsteroidal anti-inflammatory drugs (NSAIDs). However, the infection will still progress if not properly treated. Furthermore, avoiding treatment can lead to more serious complications. Seeking care and advice from a dental professional is strongly recommended as soon as possible. The treatment needed usually determines who will treat the abscessed tooth. For the most part, an abscessed tooth can be managed by a general dentist whether it is to clear an infection, perform the root canal procedure or extract the tooth if needed. Alternatively, a dental specialist called an endodontist can be consulted to treat the abscess and perform the root canal procedure. Another dental specialist, an oral surgeon, can also treat an abscess and extract the tooth if tooth loss is inevitable. For children, a pediatric dentist can provide appropriate care for baby teeth to treat an abscessed tooth. Oral surgeons as well as emergency room and ENT physicians would treat more severe cases where the infection from an abscessed tooth has spread beyond the mouth area. The prognosis depends on the extent of the spread of infection. Usually, when the infection is localized to the tooth, the prognosis is very good if treatment is sought as soon as signs and symptoms are noticed. If the infection affects much of the surrounding jawbone of the tooth and has caused the tooth to become loose, the chances of saving the tooth decrease. The typical scenario for dry socket is the occurrence of throbbing pain about two to four days after the tooth is extracted. Dry socket pain is often accompanied by bad breath and a foul taste in the mouth. With this onset of pain, it is obvious that proper healing has been interrupted. Dry socket is a condition of inflammation of the jawbone (or alveolar bone) after a tooth extraction. It is also referred to as "alveolar osteitis" and is one of the many complications that can occur from a tooth extraction. The hallmark of dry socket is noticeable pain that occurs a few days after a tooth is extracted. Pain from dry socket is often described as a dull, throbbing pain that can range from moderate to unbearable. Good home-care habits and regular dental visits can play a big role in preventing an abscessed tooth. Time is also a big factor in whether a tooth is allowed to reach the point of infection. The longer the tooth sits with a problem, the higher chance that infection can occur and spread to become an abscess. Once a decayed, fractured, or sensitive tooth is noticed, taking the preventive steps to fix it early will help prevent bigger problems such as an abscessed tooth. Bertossi, Dario, et al. "Odontogenic Orofacial Infections." Journal of Craniofacial Surgery 28.1 (2017): 197-202. Burns, Richard C. and Stephen Cohen (Eds.). Pathways of the Pulp, 2nd ed. St. Louis, MO: The C.V. Mosby Company, 1980. There are two types of dental X-rays: intraoral and extraoral. Intraoral X-rays include bite-wing, periapical, and occlusal X-rays. Extraoral X-rays include panoramic, tomograms, cephalometric projections, sialography, and CT scanning. Experiencing tooth sensitivity and pain are common problems after having a dental filling. People with allergies to metal may suffer allergic reactions to amalgam (silver) fillings. Fillings may chip, crack, or wear away from the continual pressure of chewing, clenching, and grinding.